Protesters clashed with the police, gheraoed Chief Minister Sarbananda Sonowal's house at his native place in Dibrugarh, blocked national highways and damaged vehicles in Assam during an 11-hour "bandh" called by the AASU. Guwahati: The shutdown called by 70 organisations, led by Krishak Mukti Sangram Samiti (KMSS), against the Citizenship Amendment Bill, which was passed by the Lok Sabha on Tuesday threw normal life out of gear in Assam and other nearby northeastern states. At least seven people were injured in western Tripura in the wake of an 11-hour bandh called to protest against the central government’s controversial Citizenship Bill, which crippled normal life in Northeastern states on Tuesday. Protesters clashed with the police, gheraoed Chief Minister Sarbananda Sonowal’s house at his native place in Dibrugarh, blocked national highways and damaged vehicles in Assam during the “bandh” called by the All Assam Students’ Union (AASU). Police had to resort to lathi-charge and fire rubber bullets to disperse the protestors, while the AASU activists clashed with the police and attempted to ransack a Bharatiya Janata Party (BJP) office in Dibrugarh. Opposition Congress, the All India United Democratic Front (AIUDF) and the Krishak Mukti Sangram Samiti (KMSS) supported the bandh. As many as 70 organisations, led by Krishak Mukti Sangram Samiti (KMSS), began an indefinite “economic blockade” in the state today protesting against the controversial Citizenship (Amendment) Bill, 2016. The groups have affirmed that they would not allow locally produced oil, petroleum products, coal, forest products and limestone to be taken of the state. 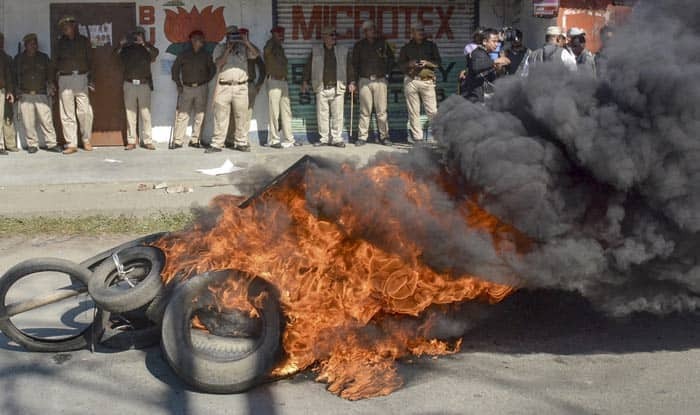 The “bandh” called by the NESO on the same issue is being supported by over 100 organisations in Assam as well as in the other north-eastern states. The agitators gheraoed Sonowal’s house in his home town, Dibrugarh, to register their protest against the bill. They raised slogans that the chief minister had no reason to continue on his post as he could not protect the interests of the people of the state. Actor Naseeruddin Shah was among a host of air passengers who were stranded for hours at the airports across Assam for hours due to non-availability of public transport following an 11-hour bandh called by various organisations on Tuesday. The passengers complained that they faced a lot of difficulty during the bandh period as no taxis, auto rickshaws or buses were available for them to either reach the airports or reach the city after landing. Transports were available only after the bandh ended at 4 PM. AASU and NESO chief adviser Samujjal Kumar Bhattacharyya told reporters, “If Meghalaya and Mizoram can adopt a cabinet resolution opposing the bill, why can’t Assam do the same? “The people of Assam, for the last 70 years since Independence, have been forced by the Centre to agitate for their rights, language, existence, culture, heritage and infrastructure.” Dipankar Nath, the president of AASU, which had led the six-year-long Assam Movement against illegal immigrants, said, “Despite wide opposition to it, the BJP government at the Centre has undemocratically imposed the bill on us as they want to win the (Lok Sabha) election by taking the votes of illegal Bangladeshi immigrants.” The “north-east bandh” called by the NESO is being enforced by its member organisations such as the Mizo Zirlai Pawal (MZP), the All Arunachal Pradesh Students’ Union (AAPSU), the Khasi Students’ Union (KSU), the Garo Students’ Union (GSU), the Naga Students’ Federation (NSF), the All Manipur Students’ Union (AMSU) and the Twipra Students’ Federation (TSF). Large sections of people in Assam and other northeastern states have been protesting against the bill, saying it will nullify the 1985 Assam Accord under which any foreign national, irrespective of religion, who had entered the state after March 24, 1971, should be deported. Notably, the Lok Sabha today passed the Citizenship Amendment Bill which seeks to provide Indian citizenship to non-Muslims from Pakistan, Afghanistan and Bangladesh. Speaking on the bill, Home Minister Rajnath Singh said it will pave way for the religious minorities—the Hindus, Jains, Christians, Sikhs, Buddhists and Parsis— from these states to get Indian citizenship. A day after pulling out of the BJP-led government in Assam over the Citizenship Amendment Bill, the AGP today demanded the resignation of Chief Minister Sarbananda Sonowal and dared the saffron party to face fresh polls. “The BJP-led government was formed in Assam on the basis of a pre-poll alliance with the AGP. As this alliance no longer exists now, we demand that the current Assam government be dissolved,” Mahanta told reporters. Accusing the BJP of adopting an anti-Assam policy, Mahanta said, “Let the BJP form a new government alone. We will welcome that”.